Cream cheese and whipped cream combine for the best of both worlds. It is fluffy and light like whipped cream with just a bit of that cream cheese tang and extra stability. This stuff is amazing! Good morning! I hope you weekend has been fabulous. Ours has been busy, but so much fun. My Maw-Maw and Paw-Paw are in town visiting, so there has been family gathering after family gathering. So we are fat, happy and a little bit tired this morning. Friday we had dinner at K.C. and Collin's. They did a great job of hosting. We dubbed it "Fish Friday." They had a variety seafood out for appetizers along with cheese, crackers and a crab ragoon dip. 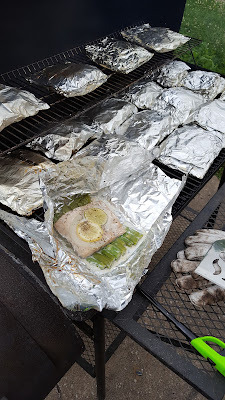 Then there were two kinds of salmon for dinner and yummy veggies. Collin even made a mango-peach smoothie for everyone. My little brothers really are excellent cooks and put on a great dinner. MiMi made an ice cream sandwich cake for dessert, which was a pre-birthday surprise for Chloe. Yesterday we celebrated Chloe's birthday. Jax and I called her to see if she wanted to go to the park with us in the morning. Next thing we knew, the whole crew met us there! Jax had fun showing us the ropes on the playground. Then we had dinner and yard games and MiMi and Pops'. Chloe requested chicken, bacon alfredo roll-ups for her birthday dinner. They were delicious. I was in charge of dessert, Chloe has been asking for the brownie cheesecake with mocha whipped cream and it was as much of a hit the second time around as it was the first! The night ended with a water war of epic proportions. We had a blast! None of that really has anything to do with this recipe, other than it explains why it went up late. By now we all know that I am a fanatic when it comes to frosting and whipped cream. I love trying new things. I have been enjoying playing with different flavors of whipped cream lately. The cocoa whipped cream is easy and delicious and the mocha whipped cream is to die for. This one is fun too! There is enough cream cheese in it to give it that slight tang you might expect, but it gives the whipped cream some extra stability and makes it fun to pipe! I served wit alongside a cake with some berries, but it would be great just with berries in a bowl and would take your strawberry shortcake to the next level! You just have to give it a try! 1. For the best results, put your cream in the freezer for just a few minutes while your gather your ingredients and beat the cream cheese.2. It is best if your cream cheese is still at least cool when you get started, but you want it to be soft enough that your mixer can get it beaten smooth. Beat together the sugar, vanilla and cream cheese until smooth.3. With the mixer still running on medium, drizzle in the cream. 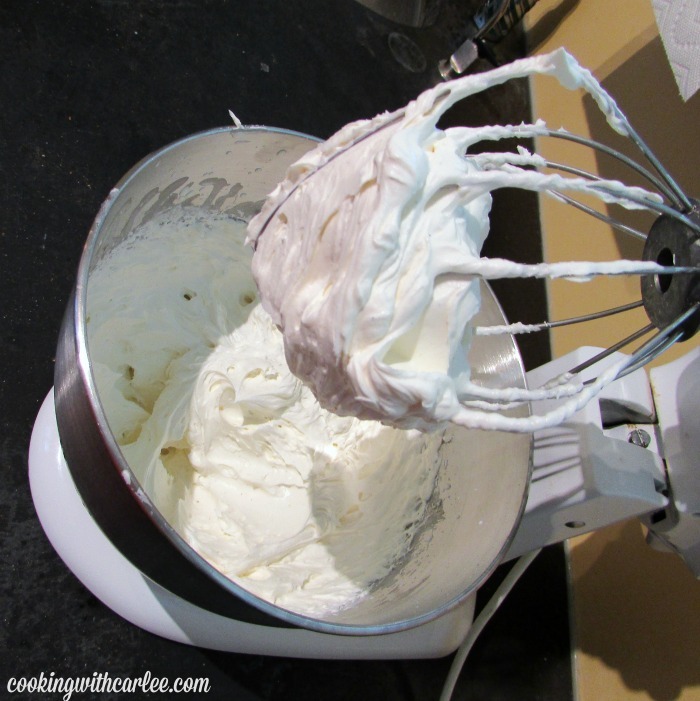 Once it is all incorporated into the cream cheese and turn the mixer on high and whip until stiff peaks form.4. Pipe or spoon onto your dessert, store leftover in the refrigerator. It is so good, fluffy and fun. I hope you love it! Well I could just have a whole bowl of that!!!!! Yum! Glad you had a fun Weekend!! Yay for Fish Friday's!!! Me too! Or just a big old bowl of this and a bowl of strawberries to balance it out. Mmm! Heaven! That's what this sounds like! YUM! Yep, this has to be good. Thanks for the idea! It really is and so darn good! It's perfect for summer because it isn't quite as wimpy as real whipped cream can be sometimes, but every bit as fluffy. Plus that cream cheese flavor goes perfect with berries! Why have I never had this kind of frosting before???? I need to reorganize my baking list to have something to go with this asap! You really have to give it a try! I used some as garnish for a simple cake and the rest ended up just being served with bowls of berries. It is soooo good! You do have the BEST frosting recipes, Carlee! Love it!! Thank you! I think I may have frosting running through my veins! Yum! This sounds delicious - especially for topping strawberries. Thanks for linking up with Merry Monday this week! Thanks, Emily! It is perfect with berries! I love cream cheese icing, but there are times when a dessert calls for a lighter touch. This is the perfect mix of fluffy and cream cheesy! Yeah! 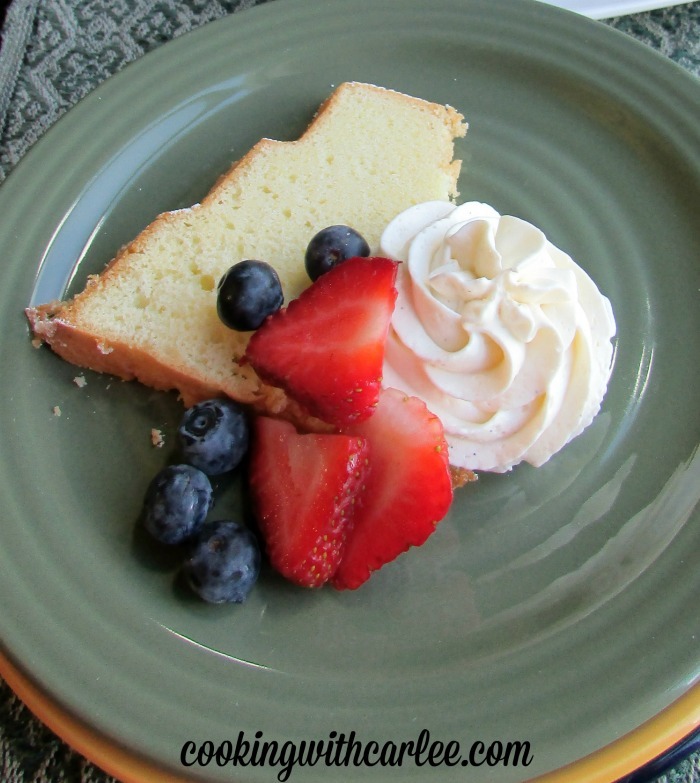 Now I'm in the mood for pound cake and berries, topped off with this delish concoction! YUM! I'll whip up a batch and you can head on over. We can sip some coffee and have some dessert! Yes and I love shortcakes this time of year! Thanks so much for hosting!